A reminder that there is a outreach Post Office service in Garvald, operating from the village hall on Thursday mornings from 9.30 to 11.30am. Chris and Lorna are giving up the Post Office at East Linton at the end of February, but Chris will continue to operate the service after this date, as temporary Postmaster, until a new Postmaster is found. There should be no break in the service during the transfer so please come along and make use of the Post Office whenever you can. This entry was posted in Post Office on February 21, 2018 by Admin. Apologies for the short notice but Chris Park will not be able to attend the Garvald Village Hall Post Office on Thursday 21st January, due to a funeral. The Post Office will be open as normal the following week. This entry was posted in Announcements, Post Office on January 20, 2016 by Admin. Post Office: Let’s use it, not lose it! 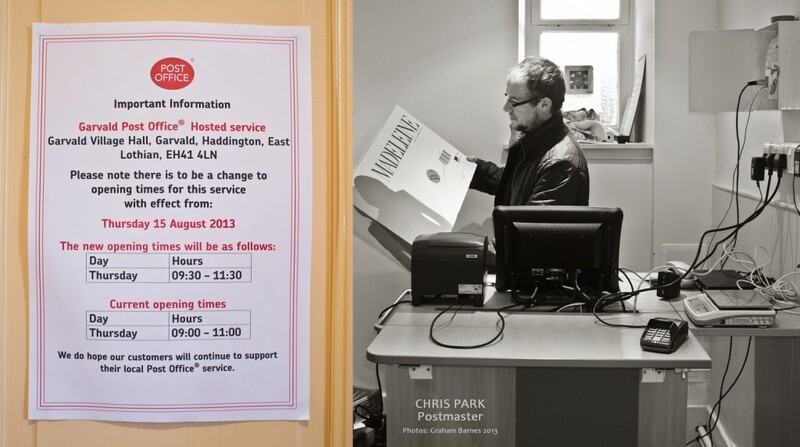 Chris Park, the new Postmaster of Garvald Post Office, would like to remind you that he offers a wide range of postal services in the Village Hall on Thursday mornings from 09:30 to 11:30. It’s a very useful facility to have on our doorsteps, so why not come along soon and make use of the Post Office to post all your Christmas parcels and buy your stamps. This entry was posted in Post Office on November 15, 2013 by Admin. Due to the ISDN connection being inactive we have been unable to provide the outreach Post Office service the last two Thursdays. We have now got BT involved to fix the problem and hope to be back as normal next Thursday. Thank you for your patience and we look forward to seeing you in future. This entry was posted in Post Office on August 2, 2013 by Admin.